The following text was originally published in Artvoice; to see it at its original location, click here. Gravy (grā’vē) n., pl. –vies a. The juices that drip from cooking meat. b. A sauce made by thickening and seasoning these juices. It’s as ubiquitous at a Thanksgiving feast as the turkey itself. Mashed potatoes would be nothing without it, ditto for the stuffing. Sometimes it’s thin and sometimes it’s thick but it’s always there. I’m of course speaking of gravy. But what is it, really? If you think about it, it’s simply meat juice that has been thickened. But while this may be true it’s also nothing short of alchemy, for there are as many insipid and flavorless gravies as there are delectable ones. Gravy may be part of our historical Puritan feast (though I do question if it were on the original Thanksgiving menu), but its roots go back further. Gravy is a simple sauce, to be sure, and French chefs were the first to codify sauce making. This said, gravy is something of a first cousin to the classic au jus (with juice), or jus lié (bound or thickened juice), or even more specifically and in plain English: the thickened juices that dripped from roasting meat. The etymology of the word gravy also points to the French. According to historian Harold McGee, in his encyclopedic tome, On Food and Cooking, the word gravy comes from the antiquated French word, grané, which later became gravé. It’s easily apparent how this could come out sounding like gravy to an anglophile. Mr. McGee goes on to stay that the n was most likely changed to a v in a simple calligraphy error when transcribing one manuscript to another by hand. Ok, by now you’re probably thinking enough with where it came from, just give me a recipe. The thing is, like many dishes, there is no one recipe for gravy, only methods; it really depends on your situation--but it’s still very simple to make. The variables are whether there’s a lot of liquid after the turkey is roasted or if the pan is dry, whether you’re making it directly in the roasting pan or a saucepot, and if you plan to thicken it with flour or cornstarch. Speaking of starch, the preferred method by most professionals is flour, and to do this the flour should be cooked in fat (butter, oil, or turkey grease), lest it leave a lingering starchy flavor to the gravy. And when you cook flour and fat together you are really making a roux, which is not only the foundation to most thickened soups and sauces, but is also French in origin; the word roux is said to be derived from an old variation of the French word rouge, meaning red, which no doubt makes reference to the change of color that occurs when flour is cooked. At any rate, I’ll stop complicating an uncomplicated recipe and offer three different methods for making gravy. They are extremely simple and can be adapted to whatever type of meat you happen to be roasting. When adding liquid to gravy I recommend using broth not water. Professional cooks have homemade stocks readily available, but in the home kitchen canned broth is perfectly acceptable. Keep in mind that canned broth already contains salt, even the low sodium variety. Turkey Gravy #1: When the turkey is finished roasting and only a small amount of liquid remains this method works well. This is also the classic method. Remove the turkey to a platter. Place the roasting pan on the stove over medium heat and cook it until the liquid evaporates. Pour off all but a couple tablespoons of fat. Add a few tablespoons of flour and cook it for a few minutes, taking care not to burn the flour. Then whisk in a cup or two of chicken broth and scrape any browned bits from the bottom of the pan, which are pure flavor. Simmer the gravy for a minute or two then strain it to remove any lumps and brown specks. 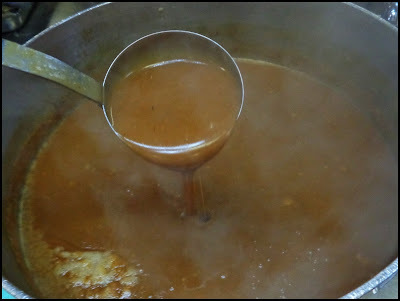 Turkey Gravy #2: If there is a large amount of liquid in the pan this is a better method to follow. Remove the turkey to a platter. Pour the fat and liquid into a pot or bowl. Using a spoon or ladle transfer a few tablespoons of fat to a small sauce pot, remove the rest of the fat from the liquid and discard it. Heat the sauce pot over medium heat. Stir in an equal amount of flour and cook the flour/fat mixture for a minute or two while stirring. Add the turkey liquid to the sauce pot and bring to a simmer. Lower the heat and cook the gravy for a few minutes, then strain it to remove any lumps. Season with salt and pepper if necessary. 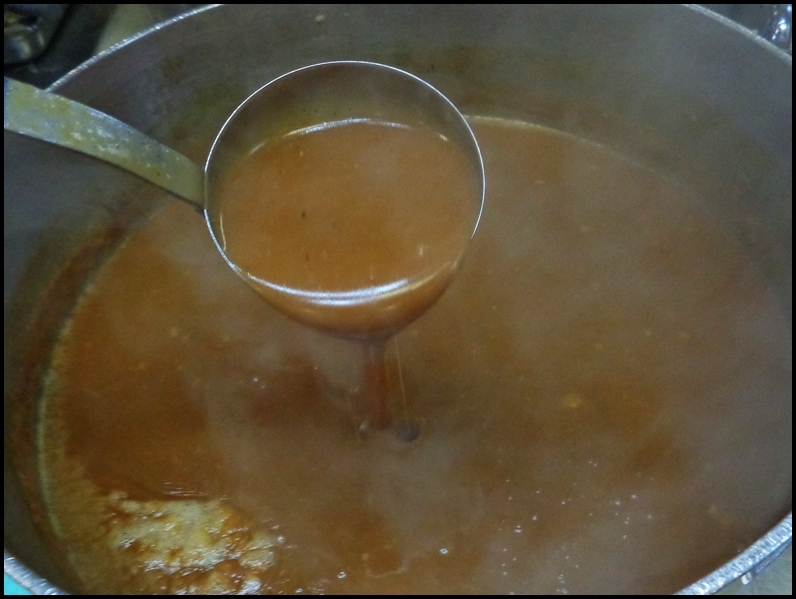 Gravy #3: This is the simplest method, though the gravy will have a transparent sheen to it, rather than the typical cloudy sauce-like appearance. With this method it doesn’t matter whether there is a lot of liquid or a little. Remove the turkey to a platter. If there is a lot of liquid remaining in the pan, pour it into a sauce pot and remove and discard the fat. If there is little or no fat remaining in the pan add a couple cups of chicken broth and place it over medium heat. Scrape any browned bits from the pan, then transfer everything to a sauce pot; remove and discard the fat. Bring the liquid to a simmer. Dissolve a few tablespoons of cornstarch in an equal amount of cold water and add it to the simmering liquid. Bring the gravy to a boil and simmer for a minute or two. Season it, if necessary, and strain to remove any lumps or brown specks.